It is funny the frustrating things that slow-motion blur into helpful, then hop into good in the long run. I don't tend to expound too much on Kipling's rougher nature but it is something that we live with everyday. Our adopted dog was definitely beaten in his previous life and bitten too. So let's just say that he tends to strike first when in doubt. I have learned to be as careful as a CIA agent when out on our walks for good reason, certainly as many folks tend to just open up their doors and let their dogs roam unaccompanied in the South of France. I tighten my grip on his leash and scan the horizon; I pay attention to the snap of each twig breaking, ready for what might come up at the next turn in the bend. Frankly, it can be a little exhausting but it is just a part of love. And over months - certainly since we have moved out to this village - I have come to rely heavily on my instinct. I listen hard to that inner voice far more than I used to. It can be uncanny how a "Wait. No, stop here," has continuously averted potential dangers. And it serves me for light-hearted pursuits as well. It was already late yesterday evening when I decided to ride my bike out to the garden. A big storm had been announced for today - yes, one that hit hard and had both dogs, including Kipling, hiding under my desk - and I wanted to make sure if there was anything that needed to come in. Remi had given me the black vintage bicycle for my birthday present. It needs huile somewhere up front - I am the veritable squeaky wheel - and so call my ride The Cricket. It was already wheezing heavily when I made a last minute right turn after la pharmacie to take the back road out. It is much longer, so much so that I had never ridden that path before but something had tugged me, go. I weaved around speed bumps and passed houses spinning chimney smoke before bumping down a dirt path next to an apple orchard. Yes, it was good that I had come as there were several newly tumbled tomatoes to rescue. I didn't linger, the light was blooming. 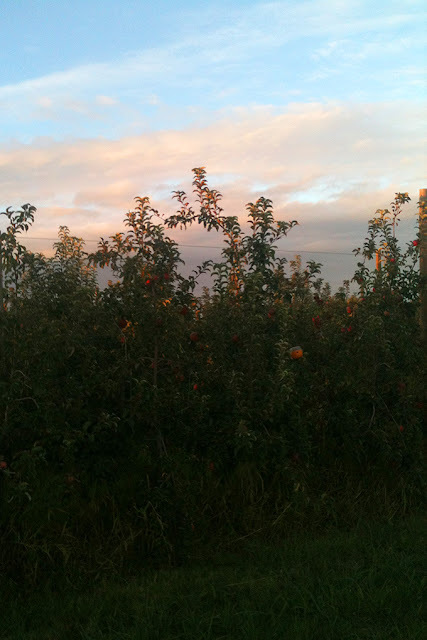 I pushed the pedals, rose up in my seat and caught my breath as I pulled up alongside the apple trees once more. Their perfume was calling me in a way that I had been too rushed to feel upon arriving. A smell that was far more complex than the rubber band word apple can convey, it was a song that ran from blossom to fruition. I stopped, awkwardly as I am still not confident on my bike and fished in my pocket for my camera, any modern testimony to something so time-worn and true. Breathing in, breathing out fast, I cut across the pétanque court, wheels wobbling, light fading, straight to home, grateful for hearing and believing what I do. Ahhh - why WOULDN'T you write a post on a Saturday night?? If only computers had a smell option (though I'm sure that will be on ios10)! 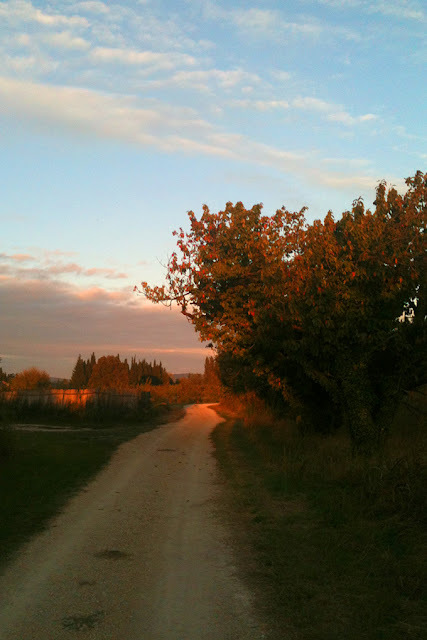 I love that your intuition led you to a new path; a beautiful, fragrant option at sunset. I'm a big believer in listening to my instinct as well, and it is almost always rewarding. Thank you for reminding us, as always, that simple pleasures are well worth stopping for and writing about. Sister, the perfume of those apples was just insane! And I mean it when I use perfume over "smell"...whoa! And thank you so much for being such an amazing supportive Sister, always. I love you so much. Beautifully written post, I was on that bike! And the photo is so atmospheric. Who knew over-ripe apples could be so beautiful? The light is exquisite in your photos - I love that red glow at the end of the road, along with the cabanon, or some structure - wonderful! I had you pictured all the way, past the apples, wobbling, wobbling, and your bike singing. You bring light to me! Thank you! You made my day by saying that Judi. It is me who thanks you and I am sending lots of Love. Thanks, as always, for taking me along for the ride. And, yes, let's hear it for paying attention to that often way too teensy inner voice -- sometimes we shrug it off at our peril. "Peril" is such the right word Judith...I could give some examples of what we in our collective consciousness have been ignoring but that would be preaching to the choir. Lovely images, I can smell and feel the crisp air. Your shots of the moon are beyond splendid! Well done. HE GAVE YOU A BICYCLE............I LOVE THAT! I got a BICYCLE for giving BIRTH the FIRST time!Lets just say I was not SO happy.............but I am THRILLeD for YOU!Thats perfect!Home to GARDEN on the BICI!!!!! BEAUtiful thoughts that accompany your Beautiful photos!NEVER BORE ME!!! As my Mom so perfectly put it: I now have "a set of wheels"!!! Hooray!!! And it isn't just any stupid bike but the most ME vintage bike in black with a bit of gray plus Remi bought elastic cords in Hermes orange to hold my things in place in the basket and the rack on the back! And thank you for the reassurance, most certainly as you have been reading on for nearly five years now! Yes, the BIKE was to HELP me get back in shape after the baby came..........THAT DIDNOT GO OVER AS WELL AS HE EXPECTED!I still have the BIKE.Will NEVER get rid of it!Let's just say HE MADE UP for that MISTAKE over the next 28 years!!!!! What a particularly beautiful image, with the orange and blues and pinks! It glows! How far is it to your little cottage garden? Sometimes you need the alone time without men or dogs, to see and absorb and think. Your post was lovely. Quite calming and zen-like. Here in Melbourne, spring arrived with a slow start, but suddenly yesterday was full on summer, with 31.5C (about 88.7 degrees). My Labrador goes outside to "sunbake" and then bangs on the frenchdoors with his nose, desperate to seek shelter in the airconditioning for a while, sitting there panting. Only to start the cycle all over again shortly afterwards. He's a funny boy! I hope you put those fresh tomatoes to good use! Both of my boys do the same when it is summer here!! It must be a Retriever thing. :) And yes, of course I am using up the last of the tomatoes well...last week I was so obsessed by the fresh goat cheese and tomato sandwich that I had for lunch that I made it twice. Please know this is a deep complement. I long reflected on today's essay, photos, mood, and memories. I wrote a poetic comment and thought more. Just woke up now, next to lap top, the first deep sleep in days hard news. Thank you for the gift of peace and a small time in another time and place. Joan, will you trust me when I say that this was exactly what I needed to hear today? Thank you. Without a doubt, I do. Thank you. Pedaling against the storm, riding the fragrance of apples and catching the veil of sunset, camera balance on the wobbly wheel, you accomplish the pride of persistence. Wonderful. Heather I am lost in the image, it so beautiful and your writing so inspiring! Always, always trust your inner voice. I think that as we get older, and more comfortable in our skins, it just gets easier to hear it and to listen to it. The light in that first photos is just truly magical. And to think that I took that photo with my crappy old iphone Loree! You should have seen the light...it was amazing. I agree with you about it getting easier as we get older. Our world is so crazy, it helps if we at least have a bit of inner guidance from time to time. That first photo is stunning! You're so right about the complexity of orchard perfume. The fallen apples decomposing can be so sweet and beautiful smelling, even though you know it's a little gross! One of my favorite smells is "slightly rotten pineapple" when my Williamsburg Christmas decorations are JUST starting to bite the dust. By the next morning, the smell has tipped from sweet to gross. The universe knew Kipling needed a highly sensitive and intuitive mother and protector. It's awful when animals must be punished for their abuser's choices. You save his life every day. Stephen, the end of your response made me tear up so much when I first read it that I couldn't type, so belatedly let me thank you for that...not to mention the giggle for "slightly rotten pineapple"...you and Ellie both are so strong at blending the serious, the silly and the sublime so effortlessly. Will you please save up to come and visit us? Please? Please?